If you created a publication that you want to share with others who don't have Publisher, you can save it as a PDF (Portable Document Format) or XPS (XML Paper Specification) file. Commercial printers often prefer to receive a PDF file for printing. Choose PDF if you want to save your publication in a format that can be easily shared and is used by many commercial printers. 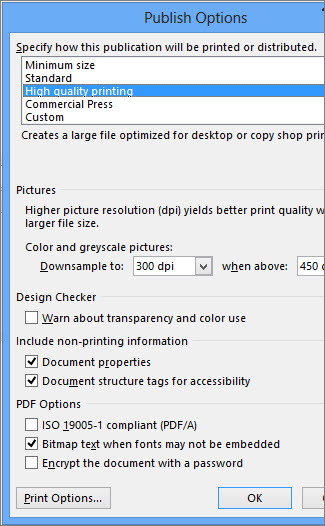 Choose XPS if you want to save your publication with even greater compression than PDF format. Read more about PDF and XPS formats. Click File > Export > Create PDF/XPS Document > Create PDF/XPS. For File name, type a name for the publication. 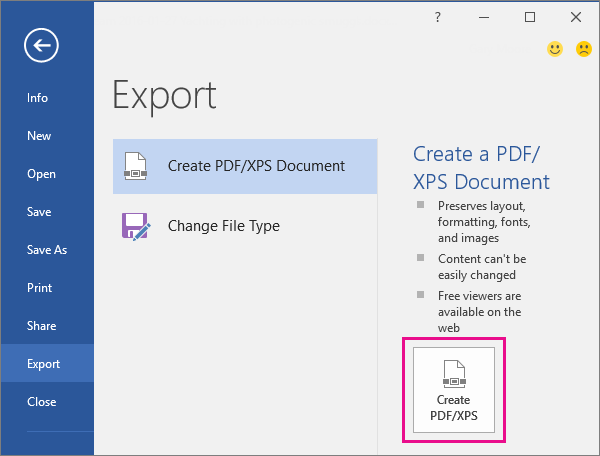 For Save as type, select either PDF or XPS Document. Click OK, and click Publish. Click File > Save & Send > Create PDF/XPS Document > Create PDF/XPS. In the Save as type list, select either PDF or XPS. Your publication will be saved by default with the .pdf for .xps extension, and it will be optimized for high-quality printing. You can change to a different setting by clicking Change, which opens the Publish Options dialog box. Find links to more information about the Publish Options dialog box in the See also section. Note: You can also save the file as a .pdf file by using the Save As dialog box. Both file formats are designed to provide read-only documents with optimal printing qualities. They also embed all needed fonts, preserve metadata, and can include hyperlinks. The recipients need the appropriate viewer for the file format before they can view your files. Note: These formats provide a way for others to view your publication only. The resulting files cannot be changed in Publisher. Saves CMYK, spot color, and process color, as well as spot color in CMYK and PANTONE® — the formats that are preferred by commercial printers. Includes alternative text for images or imaged text. Embeds all needed fonts into a file before printing. Provides searchable text and hyperlinks. Preserves any metadata that is associated with the file. Provides Information Rights Management so the file owner controls who can open the file. Recipients who have not been granted rights cannot view the XPS file. Needs the correct viewer, available as a downloadable add-in from Microsoft.